Terahertz light can be used to identify numerous complex molecules, but has traditionally remained unexploited due to the lack of powerful broadband sources. Pulsed lasers can be used to generate broadband radiation, but such sources are bulky and produce only microwatts of average power. 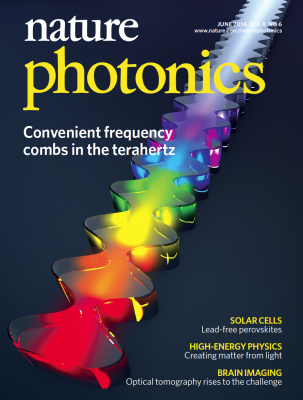 Conversely, although terahertz quantum cascade lasers are compact semiconductor sources of high-power terahertz radiation, their narrowband emission makes them unsuitable for complex spectroscopy. In this work, we demonstrate frequency combs based on terahertz quantum cascade lasers, which combine the high power of lasers with the broadband capabilities of pulsed sources. By fully exploiting the quantum-mechanically broadened gain spectrum available to these lasers, we can generate 5 mW of terahertz power spread across 70 laser lines. This radiation is sufficiently powerful to be detected by Schottky-diode mixers, and will lead to compact terahertz spectrometers.